Ulster's Nick Williams has been named RaboDirect PRO12 Players’ Player of the Year, with team-mate Luke Marshall scooping the Young Player of the Year award. Williams and Marshall doubled up to round off a perfect weekend for Ulster Rugby as they scooped the top two awards at the RaboDirect PRO12 Awards evening on Sunday. Two days after Ulster clinched top spot at the end of the regular season, with a convincing 32-17 home win over Cardiff Blues, two of their stand-out players of the season so far were honoured at a star-studded occasion at the Clontarf Castle Hotel. Both men had already been named in the PRO12 Dream Team for the season last week and Williams scooped the Players’ Player of the Year award for his outstanding back-row contribution to Ulster’s march into the play-offs. Marshall picked up the Young Player of the Year title after not only breaking into the Ulster side, but also into the Irish national team. After four seasons playing in the competition at Munster and Aironi Rugby, Williams headed to Belfast this winter and revealed his full array of talents as he scored six tries in 16 appearances in the RaboDirect PRO12 league. At times unstoppable on the charge, he more than filled the gap left by the departure of Pedri Wannenburg at the end of last season. The New Zealand No 8 beat British & Irish Lions flanker Justin Tipuric and Glasgow Warriors’ Fijian scrum-half Niko Matawalu to the title. He follows in the footsteps of Tommy Bowe (Ospreys), Ruan Piennar (Ulster Rugby) and Tim Visser (Edinburgh Rugby) in picking up the prestigious award. Marshall had only started five games for Ulster in the RaboDirect PRO12 before this season, yet he grew into the centre role and not only played 11 times, but also won three caps in the RBS 6 Nations. The 22-year-old struck a great partnership with Darren Cave in the Ulster midfield and earned rave reviews throughout the campaign for his tough defence, good distribution and eye for a gap. He beat Cardiff Blues outhalf Rhys Patchell and Connacht Rugby fullback Robbie Henshaw to the title, and follows in the footsteps of Tim Visser (Edinburgh Rugby), Toby Faletau (Newport-Gwent Dragons) and Stuart Hogg (Glasgow Warriors) as the PRO12 Young Player of the Year. It was a good night for Ulster, who host the Scarlets in the first of the two play-off matches at Ravenhill on Friday night, as they also scooped a £10,000 cheque to put towards youth development after winning the Specsavers Fair Play Award for having the fewest yellow and red cards and citings over the 22 games – a mere six yellows. 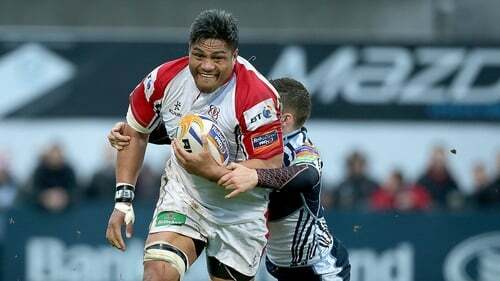 They took over the mantle from play-off rivals Leinster Rugby, who had won it for the two previous seasons, who finished second with six yellows and one citing. Former Scotland and Lions outhalf Gregor Townsend won the Coach of the Year title from Ulster’s Mark Anscombe and Benetton Treviso’s Franco Smith after steering Glasgow Warriors into the play-offs. His side put together a record number of wins during the campaign and finished in third place overall to secure an away trip to the RDS to face Leinster this weekend. Leinster are the only team the Warriors failed to beat in the regular season, although they took a losing bonus point away with them from both matches. Third time lucky in the play-offs maybe? Connacht Rugby’s Michael Swift received the Chairman’s Award in recognition of his outstanding service to both his province and the tournament as a whole. He became the first player to break the 150 game barrier this season and completed his 164th appearance against Glasgow Warriors last Friday. The 35-year-old London-born lock has played in every one of the 12 seasons of the competition, and has signed for at least one more season with the Galway-based outfit. The Scarlets took over from Glasgow Warriors as winners of the Rhino Collision Kings title after a panel of experts assessed their efficiency at the breakdown and tackling, while Ian Madigan followed in the footsteps of his Leinster team-mate Johnny Sexton and Munster’s Ronan O’Gara in scooping the Rhino Golden Boot. Madigan forced his way into the Dream Team for the first time and ended the regular season with 186 points from his 21 appearances, kicking 60 goals – 24 conversions and 36 penalties. He only missed the target with nine attempts – three conversions and six penalties – and ended with an 87% success rate, including landing his last 21 kicks in a row. Ospreys skipper Alun-Wyn Jones, another player to make the Dream Team, took over from fellow Welshman Nigel Owens as the winner of the ‘RaboDirect Straight Talking’ title.